It's been over 50 years since something many called a UFO landed near a military base in Roswell, New Mexico, and the mysterious incident continues to capture our imagination. Although some people still aren't sure exactly what landed in Roswell, science fiction knows the extraterrestrial truth. In scifi, the crash site has become the scene of many a predestination paradox, grey alien, government conspiracy, and sought-after technology. Check out our list of Roswell's greatest crash landings and cover-ups and decide which one you should believe.Roswell: Based on the Roswell High series of young adult novels, the WB/UPN TV series blended extraterrestrial sci-fi with teen drama. Max, Isabel, Michael, and Tess are human/alien hybrids, cloned from members of the Antarian royal family. Their pods, which landed in Roswell, were spirited away and left in a ship in the desert for 40 years before hatching human-shaped tots. But things don't really get complicated until they become hormonal teenagers willing to divulge their secrets to anybody with a cute smile. Futurama: In "Roswell That Ends Well," an incident involving metal in the microwave sends the Planet Express crew back to the year 1947 and causes the ship to crash land in New Mexico. The military personnel find Bender's body, which they mistake for a flying saucer, and perform an alien autopsy on a still-living (and still eating) Dr. Zoidberg. The episode won an Emmy and had far-reaching ramifications for the series, though due less to the Roswell incident than to Fry's rather disturbing solution to the grandfather paradox. X-Files: Fox Mulder is always after the truth of alien life on Earth, and, though the event is often referenced, he gets closer to discovering what occurred in 1947 Roswell in "The Unnatural." Mulder learns of Josh Exley, an alien who played baseball for the intriguingly names Roswell Grays. Exley's death at the hands of an alien bounty hunter coincided with the incident at Roswell. However, the Cigarette-Smoking Man will later suggest that Roswell was merely a smoke screen for more nefarious activities. Deep Space Nine: Quark has a well-known distaste for humans, impolitely tolerating them and their root beer at his bar. And he gains greater insight into the self-destructive history of humanity when a warp accident sends him, Rom, and Nog to the Roswell site. He witnesses a time when humans detonated nuclear weapons on their own soil and sucked down cancer-causing smoke. The only things standing between Quark and a big payoff from the gullible humans are a bunch of paranoid government officials and a return trip to his own time. 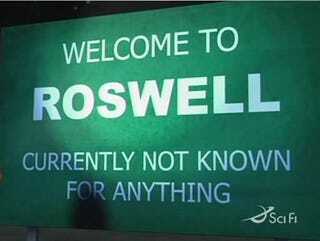 Stargate SG-1: In the Stargate novel Roswell, we learn exactly why the Asgard resemble accounts of Roswell Greys. The SG-1 team gets trapped in 1947, where they become embroiled in a conspiracy involving a crashed Asgard ship in Roswell and end up wreaking havoc with the timeline. Doctor Who: Although the Doctor has not yet found himself in the New Mexican desert, he did once visit near-future Utah, landing inside a museum of alien artifacts. The archive's amoral owner reverse engineers found alien technologies and sells them to the world, including one discovered with the Roswell spacecraft. Taken: The Roswell crash sets the events of multi-generational epic Taken are set into motion. Captain Owens becomes obsessed with the secrets of the crash, emotionally abandoning his family though his son eventually inherits his obsession. The crash's sole survivor blends in with humanity and even fathers a child, producing a line of humans with alien abilities. And, after his abduction by aliens, Russell Keys finds extraterrestrials take an obtrusive interest in him and his family. Roswell, Texas: In this alternate history online comic, Roswell and the rest of New Mexico fall within the jurisdiction of the Federated States of Texas, an independent nation seated between the US and Mexico. Upon hearing reports of a flying saucer crashing in Roswell, President Charles Lindburgh tasks a quartet of Texas Rangers to learn the truth. They manage to beat the American, Californian, and various European forces to the punch, but can't quite wrap their heads around what they find. American Dad: It's unclear how Roger went from box store greeter to interstellar traveler, but he is one of many who claims responsibility for the Roswell incident. He was eventually discovered by Stan Smith in the CIA's care at Area 51. Since then, he's gorged on snack foods, gulped martinis, watched plenty of syndicated television, and been in no particular rush to get home. The Invisibles: Conspiracy theories are truth in The Invisibles, and the Roswell alien is no exception. But instead of a creature from space who flew down to Earth in a saucer, this Roswell alien is a liquid being of pure suffering from another universe, drained into our world through the detonation of the atomic bomb. Roswell Conspiracies: Aliens, Myths and Legends: The conspirators in Roswell Conspiracies aren't covering up an alien landing at Roswell. In fact, they staged the whole thing to distract people from the fact that aliens landed long ago. And, on top of that, aliens are actually the ones behind all the creatures of folklore: ghosts, werewolves, banshees, and vampires. Indiana Jones and the Kingdom of the Crystal Skull: If Indiana Jones has to get caught up in a search for extraterrestrial artifacts, there is no better place for him to start than with a certain alien visitor to the Southwest, who has posthumously made the trip to Nevada. Ever resourceful Indy leads hard-nosed KGB agent Irina Spalko to the ET's highly magnetic remains by following the bouncing metal balls. Roswell, Little Green Man: One of Roswell's more adorable extraterrestrial immigrants comes from Bongo Comics co-founder Bill Morrison. Wide-eyed Roswell wears a cowboy hat, rides an atomically-enlarged bunny rabbit, and befriends a brilliant but underemployed diner waitress named Julienne Fryes. Independence Day: Everyone is utterly shocked when an alien mothership enters Earth's orbit and promptly vaporizes several US cities. Well, everyone except conspiracy nuts and certain members of the government, the latter having kept the aliens' scout ship stashed away in Area 51 for decades. It's a good thing, too, since that ship proves to be humanity's last hope. Tracker: Alien bounty hunter drama Tracker takes a detour through Roswell. Cole chases a pair of alien convicts to New Mexico, where they try to recover an item lost in the crash. Everyone comes up empty-handed and, in the end, the item becomes part of a diner waitress's collection of Roswell-themed tchotchkes. Majestic, The Grays: Whitley Streiber, perhaps best known for his novel The Day After Tomorrow, claims grey aliens abducted him from his cabin in upstate New York. Unsurprisingly, these aliens have been a favorite subject of his. In Majestic, he weaves together reports from the Roswell incident to enable his ex-CIA agent protagonist to discover the truth about our alien visitors. In The Grays, the Roswell incident occurred long ago, and the grey aliens live secretly on Earth, freely sharing their advanced technology. Seven Days: The NSA possesses the Chronosphere, a technology that can send one person back in time seven days to avert disaster. As it turns out, the US didn't create the technology itself, but acquired it from an alien ship that crashed en route to a penal colony. When members of Project Backstep innocently attempt to return one of the survivors to his home planet, they find that not all greys are friendly. Zoom Suit: Another piece of Roswell-found tech forms the plot of zoom suit. NSA agent Simon Bane steels a powerful alien suit the government failed to reverse engineer. But the suit was lost in a melee and discovered by 12 year-old Myles who uses it to become a superhero. Lilo & Stitch: Social worker Cobra Bubbles wasn't involved in the 1947 Roswell incident, but he did have an alien encounter there in 1973. To ensure the Earth's protection from extraterrestrial forces, he manages to have the planet declared a wildlife preserve for the "endangered" mosquito. Tripping the Rift: After getting in a fender bender with a pair of scam artist greys, Chode tries to escape higher insurance premiums by fleeing through a wormhole. The greys pursue and crash in the desert, with predictable results.